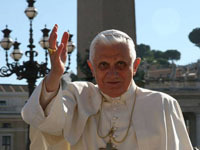 The Pope Benedict XVI has actively encouraged Catholic priests to use the power of Web-based communities to help optimise their reach where religious communication is concerned. “The spread of multimedia communications and its rich ‘menu of options’ might make us think it sufficient simply to be present on the Web, or to see it only as a space to be filled,” outlined God’s official spokesman. “Priests are thus challenged to proclaim the Gospel by employing the latest generation of audiovisual resources (images, videos, animated features, blogs, Websites) which, alongside traditional means, can open up broad new vistas for dialogue, evangelisation and catechesis,” he added. Although keen to maximise the Catholic Church’s online spread, the Pope also noted that priests seeking to fully exploit the medium should strive to be notable for their priestly hearts and their closeness to God as opposed to just their media savvy capabilities. The Tech Herald has contributed to the report.